People walking have the right of way to cross 13th Avenue in Capitol Hill, but few dare take it. Motorists, not the many people on foot who frequent the dense neighborhood, rule the commercial and residential strip. 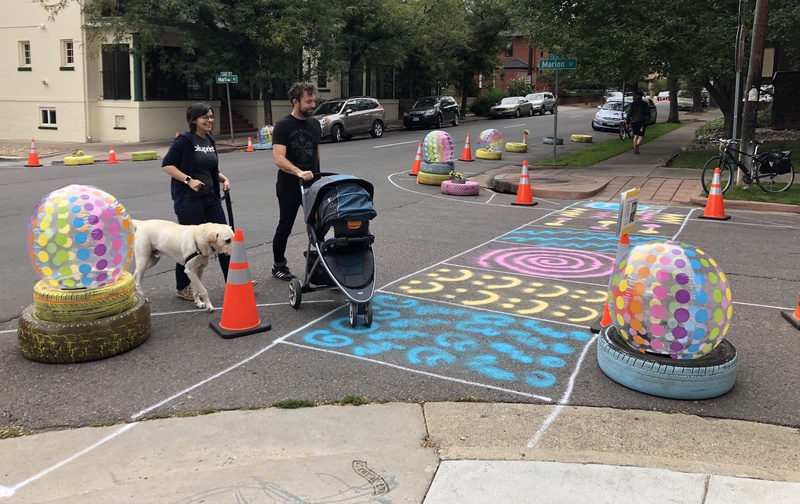 That changed for one day, Saturday, when Capitol Hill United Neighbors and WalkDenver plopped some traffic cones, beach balls, and brightly painted car tires down where 13th meets both Marion and Lafayette streets. The materials temporarily extended the curbs, forcing drivers to watch their speed as they drove down a newly slimmed street or turned onto the side streets. Meanwhile, pedestrians (and scooter riders) benefited from shorter crossings. Morey Middle School and Cheesman Park, both on 13th, add to the street’s urgent need for a retrofit. Advocates painted temporary crosswalks on Lafayette and Marion as well — but not across 13th. Denver Public Works wouldn’t allow it, even though people walking can legally cross at the intersections. 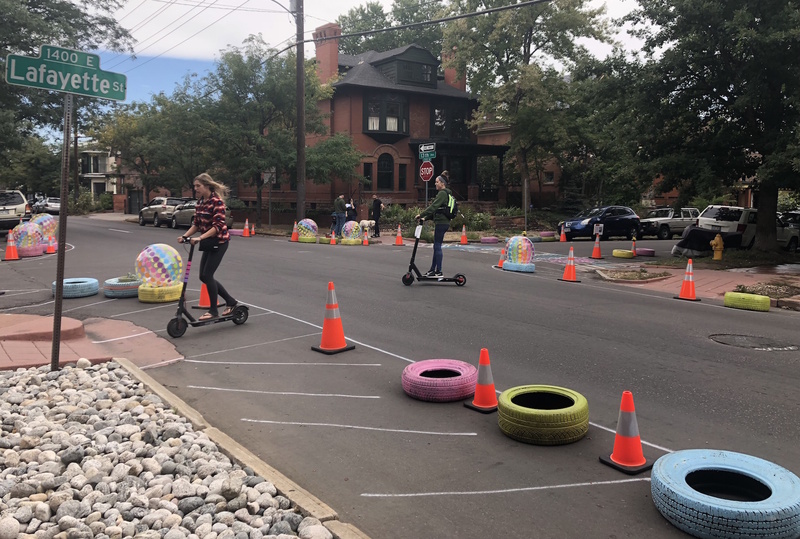 The neighborhood organization, with the help of WalkDenver, surveyed hundreds of residents between 10 a.m. an 4 p.m. to gather feedback. They recorded traffic speeds a week prior, and found that drivers often went upwards of 40 mph on the 30 mph street. We’ll see how well the test worked after WalkDenver analyzes the speed data from Saturday. At 4 p.m., advocates removed the temporary treatments and 13th Avenue went back to speedway status just in time for Saturday night. It’s incredibly absurd how wide the traffic lanes are on 13th before you get to Downing. Seriously, are they 16′ wide? There’s probably room to add a bike lane and keep the lanes of traffic. And all of that only takes paint. But 13th does need a lot more work than that, we need the third lane after Downing (towards the West) removed and made a parking lane, remove the barriers making the sidewalks usable and we need bulbouts. None of that is cheap and I’d like to see CapHill have permits for street parking. X number per bedroom minus the number of private spots per building plus guest parking permits. This would help free up parking spots for people that actually live in the neighborhood and probably encourage a few people to finally ditch their cars, we all know the cars that just sit there for weeks at a time. The money from this could go to making CapHill more pedestrian and bike/scooter friendly and SAFE. Thank you to everyone that participated in this event, unfortunately I had house guests and couldn’t attend. I don’t think “Advocates painted temporary crosswalks…” is the right wording. Every intersection is a crosswalk. Unfortunately, these crosswalks just aren’t unmarked.